It is spring in the Northwest. The water flows, the wind blows, and we pay people not to make electricity we don't need. It is becoming a regular feature. In the early morning hours last weekend, when most of us were asleep in our tepid homes hardly using a kilowatt, the power system in the Northwest was making so much electricity that something had to be done. Runoff was filling the working rivers and spinning every hydroelectric turbine. The wind blew, and helped produce record production from our many new wind turbines. The Bonneville Power Administration, the manager of the regional power grid and seller of power from federal hydroelectric dams, spilled as much water over dams as its mission to protect salmon allowed. It gave away electricity to those burning fossil fuel, so they could stop. Then, as it did a year ago, it ordered a brief "curtailment" of wind power, so not to overload the system and cause catastrophe. The wind power producers were to be "reimbursed for lost revenue," by BPA policy. 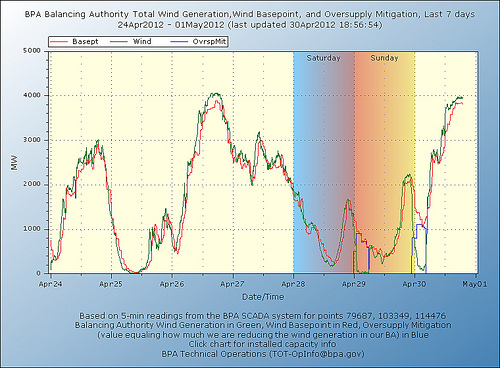 And, as they did last year, wind producers cried foul. BPA, they said, "unfairly used its control of the federal transmission system to interrupt our generators." This curtailment is most serious when you are in business not to produce electricity but to reap federal tax credits, or to sell renewable credits to utilities forced to buy them by portfolio standard laws. The BPA early this year proposed a policy that would have the electric ratepayers of the Northwest cover half the wind subsidy losses from these brief interruptions, but that is not enough to satisfy them. It can't be the absence of their electricity that hurts -- Northwest wind production, for example, went from near 4,000 megawatts April 30 to near zero by May 2, since that's the way the wind blows, and doesn't. What matters most is the flow of dollars. However this intermittent issue works out, we should be fairly certain Northwest ratepayers will cover the expense. We should be clear, exactly how much the benefits of wind power cost us and know, with certainty, that the people who fill our vistas with wind turbines have no reason to complain that we don't pay them enough. Editorial Board: Publisher Rufus Woods, Editor Cal FitzSimmons and Editorial Page Editor Tracy Warner.